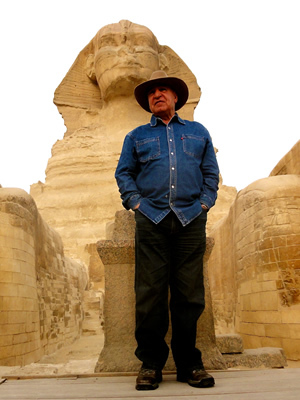 World-renowned archaeologist Zahi Hawass is the former Egyptian Minister of Antiquities and Director of Excavations at Giza, Saqqara, Bahariya Oasis, and the Valley of the Kings. Dr Hawass received his PhD in 1987 from the University of Pennsylvania, where he studied as a Fulbright Fellow. He has written numerous scholarly articles and books, and is a highly respected Egyptologist. Known for his charisma and ability to reach out to the public, for more than thirty years he has been raising awareness of archaeology and the preservation of Egypt’s precious heritage. Dr Hawass has made a number of major discoveries over the course of his career, including the Tombs of the Pyramid Builders at Giza and the Valley of the Golden Mummies at Bahariya Oasis. He has discovered two previously unknown Old Kingdom pyramids, one near the Great Pyramid of Khufu at Giza, and one belonging to a queen of King Teti at Saqqara. Also at Saqqara, he rediscovered the pyramid of the 6th Dynasty queen Khuit, along with another pyramid which he has determined that it belonged to a 5th Dynasty queen. Dr Hawass has been involved in several other important archaeological projects. He led the search for the tomb of Cleopatra and Mark Antony on the premises of a Ptolemaic temple near Alexandria. He enriched the search for the so-called “hidden doors” inside the Great Pyramid. In addition, Dr Hawass launched a new excavation under the Nile River’s waters, searching for missing obelisks and statues. One of the most significant research efforts led and managed by Dr Hawass was the Egyptian Mummy Project (EMP), which used modern forensic techniques such as CT and DNA analysis to answer questions about the royal mummies. Some of the most important discoveries that Dr Hawass has made through the EMP are his identification of the mummy of Queen Hatshepsut, the uncovering of the family of King Tutankhamun, and solving the mystery of the murder of Ramesses III. As an archaeologist deeply concerned about the conservation and protection of Egypt’s monuments, he supervised major conservation projects for the Great Sphinx, and the Serapeum and Step Pyramid at Saqqara. He has developed site management plans for a number of important areas, including the Unfinished Obelisk Quarry in Aswan, the temples of Kom Ombo, Edfu, and Dendera, the West Bank of Luxor, Giza, and Saqqara. He has also initiated the construction of nineteen new museums throughout Egypt, including the Grand Egyptian Museum (GEM) and the National Egyptian Museum of Civilization (NEMC). Under his direction, several historical mosques, churches, and synagogues have been restored and reopened to the public. Dr Hawass has actively promoted the organization of exhibitions of the treasures of King Tutankhamun in many cities in America, Australia, Europe, and Japan. These exhibitions have brought more than $125 million in revenue to Egypt. Dr Hawass’ dynamic personality and extensive knowledge have sparked global interest in ancient Egypt. He has brought the world of the pharaohs into the homes and hearts of people all over the world through his numerous television appearances and books for general audiences. In 2006, Dr Hawass received an Emmy from the Academy of Television Arts and Sciences for a special on ancient Egypt produced by KCBS in Los Angeles. Some of his most popular TV appearances have been Mysteries of the Pyramids, live from Cairo with Omar Sharif; Good Morning America, live from the Great Sphinx with Joan Lunden; and The Today Show with Matt Lauer. He has appeared in three live prime-time productions for Fox Television – the first, in March 1999, was with Maury Povich; the second, in May 2000, was with actor Bill Pullman and host Hugh Downs; and the third was a look behind the hidden doors inside the Great Pyramid through the use of a robot equipped with a fiberoptic camera. Dr Hawass has also appeared in many documentaries by the BBC, Discovery Channel, National Geographic, History Channel, PBS, and The Learning Channel. He was chosen by the BBC for a profile representing Egypt in the New Millennium, and was featured by the CNN in a short profile in 2008. National Geographic has produced a film on his life and work. Dr Hawass is the spokesman for the CNN on archaeological news in Egypt, and he has also been featured on many TV shows in Europe and Japan. He has been profiled in print in the Los Angeles Times, the New York Times, and the London Times. Most recently, he appeared in the History Channel series Chasing Mummies. Silent Images – Women in Pharaonic Egypt; Hidden Treasures of Ancient Egypt; Secrets from the Sand; Tutankhamun and the Golden Age of the Pharaohs; Tutankhamun – The Treasures of the Tomb; Royal Tombs of Egypt – The Art of Thebes Revealed; The Great Book of Ancient Egypt – In the Realm of the Pharaohs; and Mountains of the Pharaohs – The Untold Story of the Pyramid Builders.His book about his great discovery at Bahariya Oasis, The Valley of the Golden Mummies, became a bestseller and has been published in five languages. He has also authored several books for children. He writes regular columns for Al-Ahram Weekly and has contributed to articles for GEO,along with many other popular magazines. Three important books are now in press: Scanning the Pharaohs: CT Imaging of the New Kingdom Royal Mummies (AUC Press), Giza and The Pyramids(Thames and Hudson), and Adventures in Archaeology (in French and in Italian). Over the course of his long career, Dr Hawass has been presented with numerous international awards and honors. In 1998, the President of Egypt bestowed on him the First Class Award for Arts and Sciences, and he also received the Pride of Egypt Award from members of the foreign press in Egypt. He was one of 30 international figures to receive the Golden Plate Award from the American Academy of Achievement for his accomplishments in archaeology. In July 2001, the National Geographic Society selected Dr Hawass as one of its Explorers-in-Residence, and the Russian Academy of Natural Sciences granted him a Silver Medal and membership in the academy. During November of the following year, his name was inscribed on a CD carried by the 2003 mission of the Mars Exploration Rover. Time magazine chose him as one of the Top 100 Most Influential People in 2006. The following year he was made an officer in the French Order of Arts and Letters, and in 2008 he received the rank of commander in the Order of Merit of the Italian Republic. That same year, Dr Hawass was presented with a World Tourism Award and designated a Goodwill Ambassador to Japan by the Egyptian and Japanese Ministries of Foreign Affairs. He is currently working as a lecturer in Egypt and all over the world. In cooperation with the Ministry of Tourism, he promotes Egypt’s tourism globally. He is also a writer of weekly articles in several Egyptian newspapers and magazines, as well as in the London-based newspaper Al-Sharq Al-Awsat. Dr Hawass is also working as an archaeologist and consultant for SC Exhibitions – Semmel Concerts GmbH, promoting the exhibition “Tutankhamun – His Tomb and His Treasures”. His recent book Discovering Tutankhamun: From Howard Carter to DNA was published by the American University in Cairo Press with the cooperation of Semmel Concerts. Dr Hawass’ website is a popular source of information about ancient Egypt.